About 18 months ago, the League of Women Voters of Boulder County were tired of juggling spreadsheets to manage membership, events, volunteers and other aspects of its work. After six months of research and consulting with other LWV chapters, the board chose ClubExpress, said Ruth Stemler, membership director and past president. As a chapter with 230 members and one employee who works ¼ time, it was a challenge for the club to run a nonprofit organization with all volunteers and a small budget, she said. ClubExpress makes us look so modern and so up-to-date and that’s a very good thing because we’re trying to attract younger, more diverse members. Other benefits were the ease of members to volunteer at events, renewing membership, and communications in newsletters and forums. In the past year, membership has increased 15 percent, she said. And they’re busy with new projects and events to help build the organization’s mission of informing voters on issues and encouraging participation in elections. 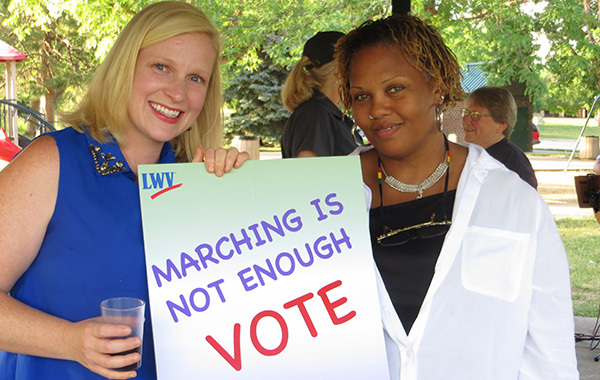 According to Ruth, one new program for the LWVBC is a series of educational events for voters as part of the League of Women Voters national theme of “Making Democracy Work” during this mid-term election year. Topics will include gerrymandering in Colorado, get-out-the-vote efforts in the 2018 election, and alternatives to the Electoral College. One education series will be “Drinks and Dialog,” an hour-long session after work hours at a bar or restaurant, with expert speakers on an issue to learn about a topic with a beverage of their choice. The chapter members are often at community events to encourage voter education and registration. Recently, they started a youth group, waiving membership fees for students who commit to 20 hours of service. Coordinating all the activities is a challenge, Ruth said. One key feature of ClubExpress—the volunteer sign-up module—has been particularly helpful, she said.